About | Belly Ice Cream - All Natural Ice Cream, Ontario Canada | Handcrafted Chef Inspired Flavours! I was a chef back in the day with newborn twins when I made up my mind that I needed a new job by the time the kids went to school. Chef life and family life are not an easy juggling act. Problem was that my life revolves around food. So what could I do? Fast Forward to Spring of 2009, the twins are headed to kindergarten that fall and I still haven’t figured it out. About four o’clock in the morning one night, I’m awake, stewing about it, and it hits me… sell “something” at the farmers market! OK… sell what? I decided right there and then, at 4 am in April that I would make ice cream. Not just any ice cream, but really awesome ice cream. Three weeks later, with no money, no business plan and no idea what I was doing; I had quit my job and was frantically trying to figure out how to load 500lbs of fully loaded ice cream freezer into the back of a trailer by myself, attempting to head to my first farmers market. That first day, I dropped the freezer off the truck, we had a brush fire, and wind kept blowing my tent away. I questioned my sanity, but people came, and people raved. Shelley is a Chef, Foodie, Mom and Wife. A well known, local entrepreneur who took a chance at doing something new to provide a more balanced work life for her family. Shelley is no stranger to taking chances. She built a state of the art production facility and scoop shop on West Road in Huntsville, has been featured on Dragon’s Den (the television show), and her Artisan Ice Cream can be found in over 120 locations plus really cool restaurants like Susur Lee & Drake’s Fring’s where you can order our very own Ice Cream! Shelley has also been featured on the Food Network’s “Food Factory”, LCBO’s Food and Drink Magazine, Toronto Life Magazine, and even blogged about by Martha Stewart as a “show favourite” at the Delicious Food Show in Toronto. Won’t forget the Return on Investment… Thanks Dragon’s Den! 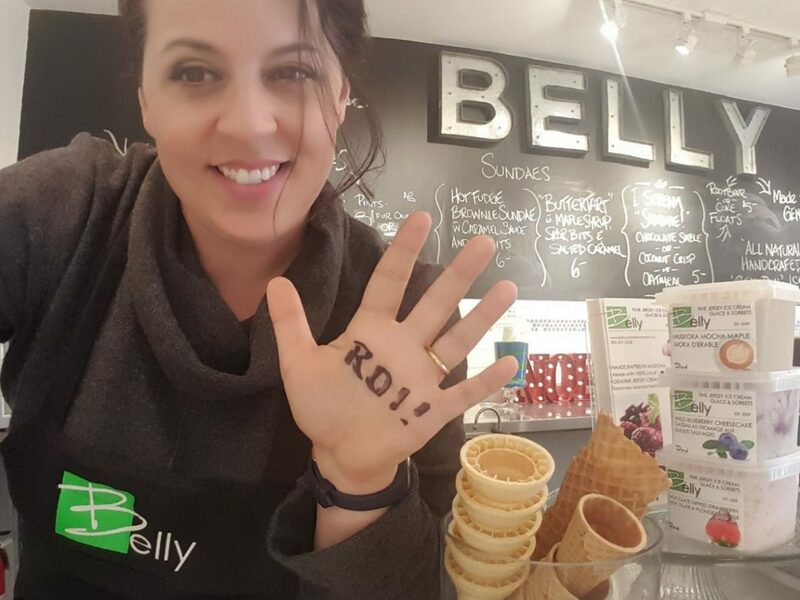 Belly Ice Cream is all natural and completely handcrafted with an obsessive attention to detail and an emphasis on creative, Chef driven flavours. Each flavour you love, is made from scratch using locally sourced, fresh dairy and the highest quality ingredients. Belly products are Low Overrun, now this is key! Many commercial ice creams can go up to 110% AIR. “Overrun” is the amount of air that is incorporated into the cream as its freezing, with no air, you would have something akin to an ice cube, standard ice cream is anywhere between 60 and 80% Overrun, but at Belly, we incorporate only 30% air, which makes a rich, creamy, dense ice cream. We keep no stock, most Ice cream companies will produce all their ice cream over the winter and keep in storage for the busy summer season, we don’t. When it’s ordered, it’s made fresh. That means no summer holidays for us, but really fresh ice cream for you! Marshmallows, Brownies, Caramel, Fudge… seriously, everything! Our Sorbets are so Good, one pint is never enough!